IBM compatible PC with a 486 processor or better. Windows 95, Windows 98, Windows NT, Windows 2000, Windows Me or Windows XP (Home or Professional). 50Mb free hard disk space. 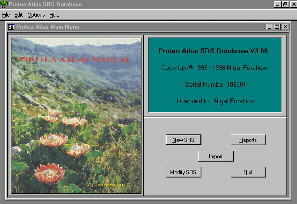 The Protea Atlas SRS Database is a Windows application that allows the atlasser to enter Protea Atlas SRS data into a user friendly computer database. Both field data and mapwork details may be entered into the database. There are many built in checks to ensure that the correct codes have been used. Printed Sight Record Sheets which obviate the need for you to do this by hand. Species Lists so you can see where you first atlassed a species. A species count is also given. Species Localities of where you have atlassed a particular protea. This may be printed in text form or on a map which shows the geographical position of where a species was atlassed. A list of Sight Record Sheets (SRS) that you have done. A SRS count is kept. A list of Southern African proteas that can be atlassed. An electronic version of your data which can be copied automatically to stiffy, e-mailed to the Protea Atlas Office or left on a ftp server for later retrieval by the Protea Atlas Office. This allows for the high tech electronic submission of data to the Protea Atlas Office as opposed to snail mail and hand delivery. A Record Locality Map that shows where you have atlassed. Thirteen different types of maps may be printed which cover South Africa and all the provinces where proteas occur. In addition the light weight GIS system from ESRI, ARCExplorer, is incorporated into the package and allows GIS maps to be drawn using shape files. On line help and context sensitive help is available by hitting F1 or clicking on the Protea Atlas SRS Database Help menu. Have a look at Tips for using the Protea Atlas SRS Database. Have a look at Genus Erica: Interactive Identification Key for a package to identify Ericas. Protea Atlas Project, Kirstenbosch PB X7, Claremont, 7735, South Africa. Only download from here if you are running any one of V3.12, V3.12a, V3.12b, V3.12c or V3.12d versions of the Protea Atlas SRS Database. You may apply the latest patch to V3.12 by downloading the Protea Atlas SRS Database V3.12e patch. This patch includes Priority and Species Richness shapefiles (which can incidentally be download separately). An updated Project file (South Africa.aep) for use with ArcExplorer is also included here so there is no need to "mess" around adding new Priority and Species Richness themes. This is done automatically by the V3.12e patch. Download Protea312e.exe by clicking on the above link. Unzip the Protea312e.exe file to the default directory which is C:\Program Files\Protea Atlas SRS Database and overwrite the previous version. Run the Protea Atlas SRS Database. It is just possible that your new system will give an error when you run it. If so, try Method 1 and failing this Method 2 to correct the application of the patch. If you click on Modify SRS and the package bombs out then you will need to "recompile". To do this, run the Protea Atlas SRS Database and on the opening screen push Alt A. The package will recompile and exit. Run the package again and then you should be up and running. Copy all the files from your D:\Protea Atlas SRS Database V3.12\*. * distribution kit on your CD, to the hard disk at C:\Tmp. (Assuming D: is the letter for your CD ROM). Use Windows Explorer to copy your existing Protea Atlas SRS data from C:\Protea Atlas SRS Database\ProtDat.mdb to C:\Tmp and in so doing, overwrite the existing ProtDat.mdb file). Remove the Protea Atlas SRS Database installation by going to Start, Control Panel, Add/Remove Programs and then Remove the Protea Atlas SRS Database. Unzip the Protea312e.exe file after the download, to the C:\Tmp and overwrite all files. Delete C:\Tmp\Protea.mdb and then copy all the files from C:\Tmp to C:\Program Files\Protea Atlas SRS Database. Run the Package by going to Start, Protea Atlas SRS Database, Protea Atlas SRS Database. A shapefile of under atlassed areas is available at Download GIS shapefiles of Priority (Under Atlassed) areas and may be opened using ArcExplorer. Unzip this download and then add the shapefile as a theme in ArcExplorer. ArcExplorer comes standard with the Protea Atlas SRS Database V3.07 and later and will allow you to add the shapefile as a new theme to the ArcExplorer project file. The shapefile requires a GIS (Graphical Information System) such as ESRI's free ArcExplorer which is a light weight data viewer, or one of the commercially available GIS systems. You may download ArcExplorer from ESRI's website. Alternatively, the ArcExplorer distribution kit may be found on the on the Protea Atlas SRS Database CD from V3.07 and up. A shapefile of Species Richness is available at Download Species Richness shapefiles. and may be opened using ArcExplorer. ArcExplorer comes standard with the Protea Atlas SRS Database V3.07 and later and will allow you to add the shapefile as a new theme to the ArcExplorer project file. If the above four paragraphs have confused you (hopefully not) perhaps the easiest is to get the latest version of the Protea Atlas SRS Database V3.12e on CD. None of the above downloads are then required.